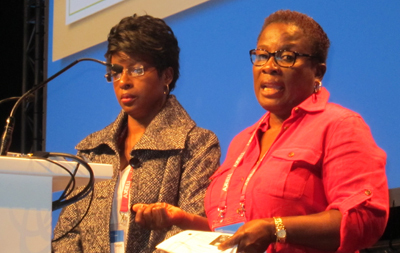 The IFLA Rare Books and Special Collections Section held a panel discussion August 20 on “Fostering Collaboration to Build and Preserve African Cultural Heritage” at the 81st World Library and Information Congress in Cape Town, South Africa. Musa Wakhungu Olaka, African global and international studies librarian at the University of Kansas. 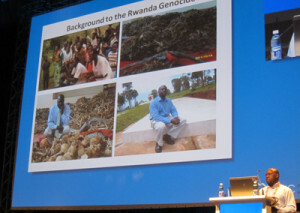 In October‒December 2012, Olaka, who then worked at the USF Holocaust and Genocide Studies Center, traveled to Rwanda to digitize the hundreds of unique documents that Ibuka had collected about the genocide—especially the 864 testimonies written between 1999 and 2000 by high school students who described their experiences up to the time they were rescued. Ibuka now holds the originals of these testimonies, as well as thousands of pages of other materials produced at the time of the genocide, Olaka said—magazines, journals, posters, documents, and letters. Esmeralda Kale (left), librarian at the Herskovits Library of African Studies at Northwestern University, and Araba Dawson-Andoh, Africana librarian at Ohio University, discuss the Cooperative Africana Materials Project (CAMP). Araba Dawson-Andoh, Africana librarian at Ohio University, and Esmeralda Kale, librarian at the Herskovits Library of African Studies at Northwestern University, described the Cooperative Africana Materials Project (CAMP) launched in 1963 by the Center for Research Libraries (CRL) in Chicago. Dawson-Andoh said that CRL and other institutions felt the need to collect Africana in the wake of so many countries gaining independence from colonial rule in the late 1950s and early 1960s. Historical newspapers: Northwestern had acquired a number of African newspapers from the 1950s and 1960s that were becoming fragile. Through the auspices of CAMP, Northwestern microfilmed the newspapers and moved the originals to CRL, which houses them for interlibrary loan and the use of CAMP member institutions. Liberian government archives, 1828‒1968: Indiana University arranged with the National Archives of Liberia to pack up and send the early state archives to Indiana for preservation and digitization, with the help of CAMP funding. Conservators cleaned, washed, and freeze-dried the materials that needed preservation work, made photocopies or transcriptions of many of them, created finding aids, then sent them back to Liberia after restoration. Nigerian state documents, 1976‒2009: These are annual reports of state agencies, budgets, government white papers, and ephemeral materials issued by Nigeria’s Plateau State. 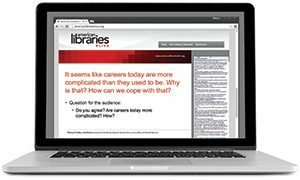 They were microfilmed in 2011 for CRL using CAMP funds. CAMP member institutions meet twice a year to discuss and vote on acquisition and preservation proposals. Kale said, “CAMP has transformed itself from a cooperative project between North American institutions into an organization that builds expertise in Africa by providing equipment, facilities, training, and preserved collections.” It has two African affiliate members now and welcomes new ones. Maria Luisa Russo, co-manager of the Timbuktu Manuscripts Project at the Centre for the Study of Manuscript Cultures at the University of Hamburg. 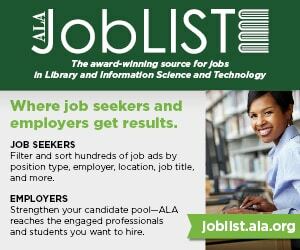 In March 2012 Islamist rebel groups overtook the ancient city of Timbuktu in northern Mali, where for centuries thousands of rare and unique manuscripts had been preserved in private libraries. Thanks to a rescue operation by the custodians, most of the manuscripts were removed and transported, in some instances by camels and donkeys, to Bamako in southern Mali where they were safe. 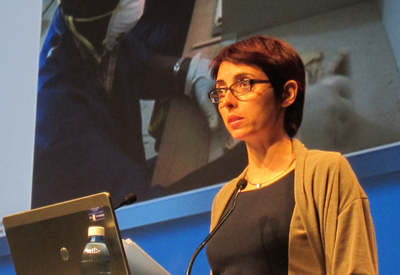 Maria Luisa Russo, co-manager of the Timbuktu Manuscripts Project at the Centre for the Study of Manuscript Cultures at the University of Hamburg, said that the manuscripts dated from the 13th to the early 20th century and “represent a complex written and multilingual heritage” that includes religious, historical, astronomical, scientific, and literary texts. In Bamako, they are currently stored in the “metal chests in which they were transported, in rooms that are partially climate controlled with fans, air conditioners, and dehumidifiers,” Russo said. “But Bamako is very humid, in contrast to the dry deserts around Timbuktu,” and this presents additional preservation problems. 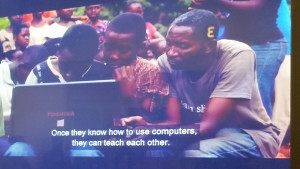 In 2013, the University of Hamburg launched a pilot project to provide technical and financial support to assessing the status of the manuscripts moved to Bamako. Russo said that more extensive measures were taken in 2014 and 2015 that include training local curation staff, cleaning and boxing some of the manuscripts, taking inventories in Arabic and French that will serve as the basis for a future catalog, and renovating six libraries in Timbuktu in preparation for the return of the manuscripts. Russo added that conservation treatments are still fairly limited, because “current standards in conservation discourage hasty initiatives in spot fixing” that may ultimately cause more damage. She said that future goals include “raising the awareness of Islamic heritage manuscripts scattered throughout Mali, not just in Timbuktu, through exhibitions and workshops for scholars and the general public,” and establishing a state-of-the-art archival facility in Bamako where the Timbuktu manuscripts can be stored, preserved, cataloged, digitized and made accessible to Malian and international scholars. 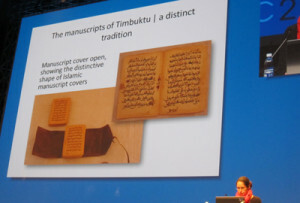 Mary Minicka, head of preservation for the Western Cape Archives and Records Service, shows examples of the Timbuktu manuscripts. 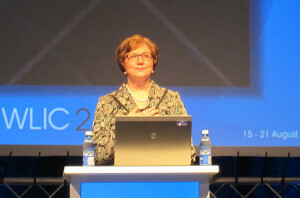 Mary Minicka, head of preservation for the Western Cape Archives and Records Service, said that her involvement with the Timbuktu manuscripts came through an official South African and Malian government effort, the Tombouctou Manuscripts Project, established after the state visit of South African President Thabo Mbeki in 2001 to view the Timbuktu private libraries. 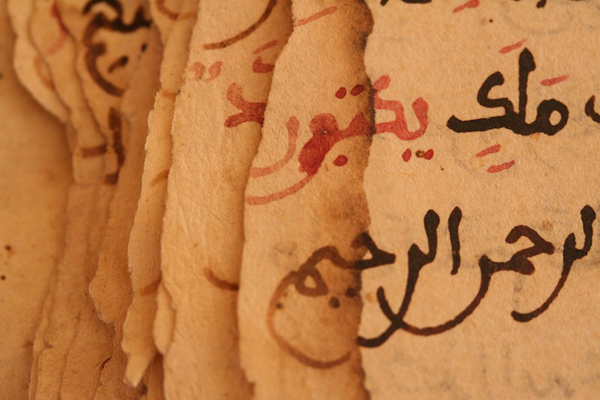 The project’s goal is to research and document the Islamic manuscript tradition in Africa, especially in Timbuktu. “Timbuktu has a hot, dry climate, and this lack of humidity affects the manuscripts,” Minicka said, “causing embrittlement and chipping. The edge of a manuscript deteriorates, curls into a little bit of a fold, then falls off completely.” The manuscript covers often deteriorate, “so much so that they no longer protect the texts.” The covers are “integral to the style of the West African Islamic tradition,” she said. “Any replacement covers we find must honor that tradition.” The project was able to halt further degradation of the damaged covers by inserting small pillows on the inside and covering the outside with quilted covers. Even the use of white gloves caused damage. “The gloves picked up sand and acted as sandpaper on the pages,” Minicka said. “These have now been ditched.” The sand is everywhere, she said, “even in your food. One of the basic challenges is cleaning the surface of covers and manuscripts that have become sandy. Future manuscript research will include investigation of the use of watermarked papers that came about through extensive trade with European countries, the manufacture of leather bindings locally (with the help of local contemporary craftsmen and tanners), the extent of African-language writings in Arabic script (called Ajami scripts), and regional variants of manuscript production throughout Islamic Africa.